With the ability to record 10-bit 4:2:2 files internally at up to 410Mbps in 4K, or 10/12-bit 4:4:4 files in 2K/Full HD,with up to 15 stops of dynamic range,the EOS C300 Mark II provides footage suitable for extensive post-production work, producing crisper images across the full color spectrum with reduced “color bleed”. The camera offers professional filmmakers and broadcasters alike the very best image quality,recording 4K in both broadcast (3840 x 2160) and DCI cinematic (4096 x 2160) resolutions.The EOS C300 Mark II can record high bitrate 4K files internally to dual CFast 2.0™ media, while simultaneously recording 4K RAW files to an external recorder, offering the flexibility and universal appeal for production at the highest quality available today. Additionally,the ability to record 2K/Full HD Proxy files to an internal SD card, at the same time, further streamlines the production workflow process. The new Canon-designed Super 35mm CMOS sensor and an increased ISO range up to ISO 102,400 deliver exceptional low light performance, allowing operators to capture low-noise footage across a variety of challenging environments without compromising on image quality. To meet the requirements of a diverse range of shooting applications, the EOS C300 Mark II offers both full manual control, ideal for cinematic environments, as well as automatic modes. These include,enhanced Dual Pixel CMOS AF (now covering approx. 80% of the frame vertically and 80% horizontally), auto white balance and Face Detection AF, all making it easier for independent news gatherers and documentary filmmakers to shoot on the go. Canon’s new range of XF-AVC H.264 codecs, designed to be compatible with industry standard Non-Linear Edit systems, makes integrating both 4K and 2K/Full HD footage into workflows effortless, while maintaining the highest image quality.The range features XF-AVC intra for 4K, andXF-AVC Long GOP and Proxy options for 2K/Full HD recordings, both of which utilize H.264 codec, offering post production flexibility and ease of use. Filmmakers can select the resolution and codec type that best suits their production,with the EOS C300 Mark II capable of shooting at up to 30P in 4K or up to 120P in 2K/Full HD. The EOS C300 Mark II offers support for a wide range of colour space options, including BT.2020, the Canon Cinema Gamut and DCI-P3. 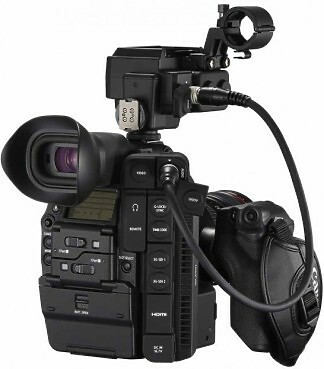 The camera is also the first Cinema EOS model to feature brand new Canon Log2 technology, which enables the 15-stops of dynamic range, significantly wider than previous Cinema EOS cameras.The camera offers new versatility for sound recording too, supporting 4-channel audio recording in 16 or 24 bit and 48 kHz. The EOS C300 Mark II boasts the iconic Cinema EOS design DNA – a modular body that can be adapted to suit the needs of each shooter and filming situation through the extensive range of compatible accessories. Internally, the EOS C300 Mark II also includes built-in electronically controlled glass ND (neutral density) filters, which reduces the amount of light reaching the sensor by up to 10 stops in expansion mode. Compatibility with the RC-V100 remote control and optional Wi-Fi control also enables ease of use in a wider range of locations. The camera’s sensor read-out speed is now twice as fast as the original EOS C300, and further reduces rolling shutter distortion, allowing for crisp image capture in a moving environment, making it perfectly suited for capturing action sequences. Leveraging Canon’s rich heritage in lens design, the EOS C300 Mark II is compatible with more than 90 current EF and EF Cinema lenses allowing operators to use their existing EF mount lenses. In addition, the EOS C300 Mark II comes equipped with Canon Cine servo zoom lens support, delivering one of the most comprehensive selections of lens possibilities for movie and broadcast production available in the market today. For further flexibility, shooters can opt to change the lens mount from the default EF Mount,to EF Mount with Cinema Lock, or to the industry standard PL mount, as a service option . Hire the Canon EOS C300 Mark II from Procam. 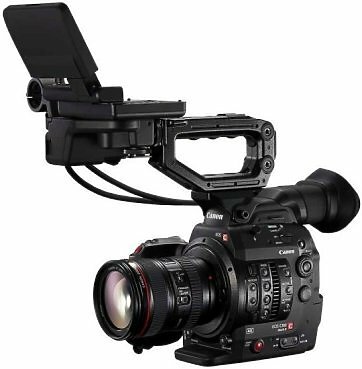 Best service and rental rates for the Canon EOS C300 Mark II and all cameras, lenses, sound, lighting and grip.